If you are experiencing a painful toothache, there could be several causes. 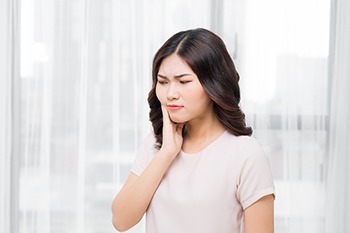 While some medical cases can be relatively easy to self-diagnose and even helped with a soothing home remedy, a persistent toothache is NOT one of those cases! A toothache can be caused by gum disease, an infected root in the tooth, a cavity, and many other reasons. The problem will only worsen over time, however, if you ignore the pain or put off a necessary visit to the dentist. Our team at California Dental Care & Orthodontics is here for you! Call our emergency dentists in Rancho Cucamonga 909.945.0024 if you are experiencing a toothache so we can get you in right away! We understand that addressing your oral health concern quickly and efficiently is of the utmost importance. We know how debilitating tooth pain can be, and we work to provide our patients with prompt relief from their discomfort. If you call with a dental emergency, our goal is to always do our best to get you into the office on the same day. In some cases, putting off a trip to the dentist can cause you to experience complications, including infection or increased damage to your tooth. Don’t put up with unnecessary pain when you don’t have to! Our experienced emergency dentists in Rancho Cucamonga will resolve your dental pain with gentle care. Our Emergency Dentists in Rancho Cucamonga Are Here for You – Now! Let us know how we can help you with any dental concerns. Call 909.945.0024 or click here to request an appointment today. As one of the premier dental and orthodontic practices in Rancho Cucamonga, CA, our team at California Dental Care & Orthodontics also provides emergency care to patients from Alta Loma, Ontario, Upland, Claremont, Fontana & Rialto, CA.